Brinicombe Equine Think Sound is a joint and mobility support supplement which helps to speed up damage repair in the horse's joints. Work puts stress and strain on the joints which leads to cartilage damage which, as the horse gets older, becomes harder to repair and requires supplementation. MSM, Chondroitin and Glucossamine are the recognised joint supplements but they need to be fed in the correct ratios to ensure maximum effectiveness. Think Sound provides this correct ratio while ensuring to optimise absorption. Included with these joint nutraceuticals are important antioxidants, known as proanthocyanidins, extracted from fruits and berries, to target the enzymes responsible for cartilage degradation. Boswellia complements the formula by optimising the body's ability to remove excess fluid accumulated around stiff joints. Chelated manganese, an essential building block for collagen synthesis, with copper proteinate are essential for long-term support and joint development in young horses. Natural ingredients with anti-inflammatory properties including MSM aids horses with stiff joints by supporting the mobility and comfort with no side effects. Lucerne, methyl sulphonyl methane, magnesium phosphate, calcium carbonate, mineral oil, l-glutamine. All horses and ponies in work or to provide support during their younger and senior years. There is an initial loading dose with this product for the first 2 weeks of feeding. 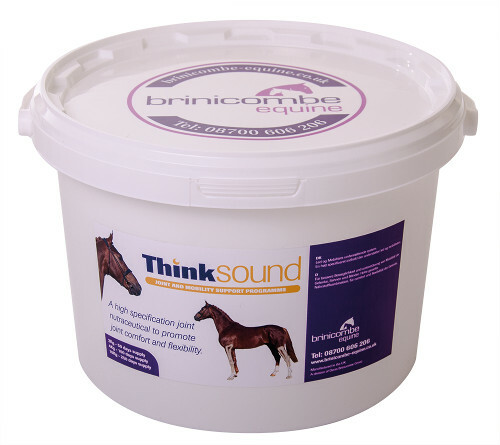 There are currently no questions for Brinicombe Equine Think Sound for Horses - be the first to ask one!